Bones Brothers Wings Food Truck. Passion is the secret ingredient behind every wing at the popular Cincinnati food truck Bones Brothers Wings. Bones Brothers Wings got its start using a family recipe that was passed onto Jim (one of the owners of the business) and a second special wing sauce that had been developed and perfected by Bryan (the second of three business owners). Lauren rounds out this business ownership trifecta. The Bones Brothers Wings team started out with humble beginnings, but lots of flavor and positive feedback from friends and family members that had the privilege of getting to taste their unique wing flavors. After positive feedback from friends the team decided to test their wings with an unbiased set of customers at local bars. When total strangers began proclaiming these were some of the best flavors they had ever tasted, the team knew they were onto something and eventually opened their own food truck serving the lucky residents of Cincinnati. In today’s featured Q/A interview Bryan, Jim, and Lauren, the owners of Bones Brothers Wings share their story about how they got started and what advise they have for aspiring food vendors in the Cincinnati area that would like to accomplish the same thing. We want to thank Bones Brothers Wings for taking the time in providing these detailed responses about their business and we hope you’ll visit their truck if you live in the Cincinnati area. FTE – Tell us about how you got started? Bones Brothers Wings – We’re all Cincinnati-area natives and have been friends for over 20 years. Jim & Bryan started grilling wings on the backyard grill for football Sundays, using an old family recipe Jim had and a spicy sauce Bryan had been crafting for awhile. The wings were amazingly tasty, friends and family loved them also, and so we approached a local bar about doing some wings nights and they quickly agreed after tasting a sample of our savory wings. Bryan had the wings, Jim thought of Skewers as a boneless option and Lauren offered her Mom’s parmesan potatoes recipe as a side. Strangers at bars don’t have to be nice to us like friends and family were, so we figured we’d get some honest feedback. People loved the food so much that we had to seriously consider a food cart or truck. Bryan and Lauren brought the culinary skill and experience, Jim brought business education/background with a side of driving skills, and the process that lead us to where we are today had begun. Along the way there was visits to Buffalo, NY to study in the homeland of the chicken wing, as well as trips to several other cities around America to try the best local wings they had to offer. Now our food truck has been open for business in the Cincinnati region for one year and two months. FTE – Where did you go to learn about starting this business? 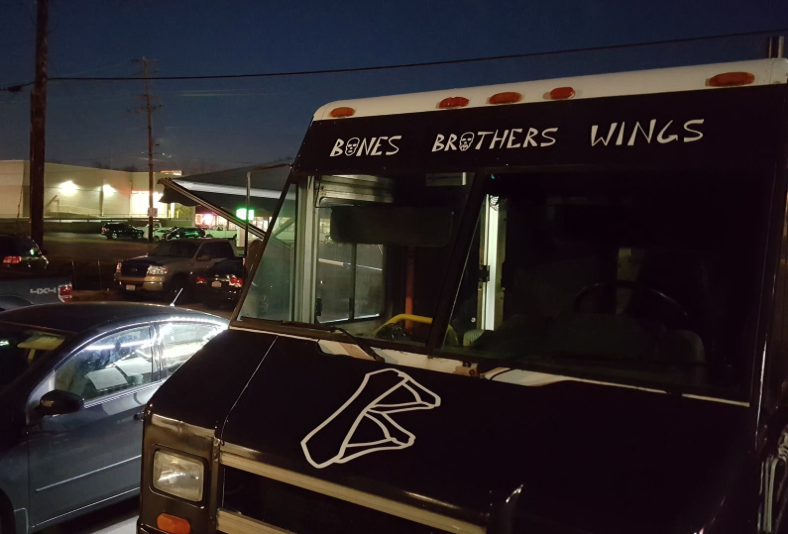 Bones Brothers Wings – We used a combination of resources to do our due diligence in researching how to start a food truck. The Cincinnati Food Truck Association was an excellent guide to begin with, as well as state and federal info and requirements. We visited local food trucks and asked questions, talked to food truck builders in our region, read articles on sites like this, watched shows and videos about food trucks and generally looked for any helpful info to figure out what we were doing and if we should even be doing it. www.cincinnatifoodtruckassociation.org/contact/starting-a-truck is a great starting point for people in the Tri-State area of Ohio, Kentucky & Indiana. FTE – Are there any unique vending laws to be aware of when starting out in Cincinnati? Bones Brothers Wings – Our city sits on the rivers edge and the state line, so half of our metro area is in another state that requires slightly different things to be licensed to operate there with a food truck. This limits some trucks from being available to everyone in the area if they’re not licensed in both states. Being in a river valley also means it’s a hilly terrain and can be hard to find a level spot to park a food truck, so we have to be prepared with boards and other tools to level up one side or one tire, since we have fryer oil, propane and an onboard generator that need to be level as possible for safe and proper operation. If you keep your food truck within Cincinnati city limits then you have to go through them for your state mobile license and health inspection. If kept outside of the city then you go through your county, which is usually much cheaper and easier. The state-wide mobile operation license allows vending throughout the state except where local towns may have banned food trucks, since local restaurants do not like competition from food trucks and a few towns give sway to these restaurant owners for now. Again, the Cincinnati Food Truck Association will have info and links regarding local health & fire code regulations. An internet search for your local and state mobile vending license, health code requirements, fire regulations and such is helpful also. Check into the city, county and state health departments to cross-reference what is required and make sure you don’t miss anything or do anything you weren’t required to do. Bones Brothers Wings in Cincinnati. FTE – What’s been the best thing about owning a food truck? Bones Brothers Wings – We love meeting new faces, visiting different places, hearing great feedback, getting to know our regular customers, being part of fun events, and building an original local flavor for our city to call their own! We especially enjoy bringing everyone together from different backgrounds who enjoy our menu and, when we’re done, taking what food we have left to give to someone less fortunate so they might enjoy it also! It’s truly been a fun and positive experience to see and hear how much people enjoy what we’ve created. FTE – Any tips for folks that want to start their own food truck in the area? 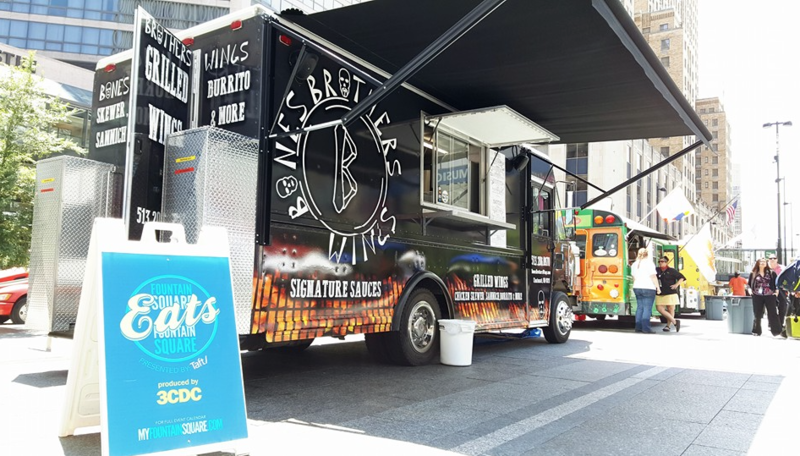 Bones Brothers Wings – There are many good pointers, but if there’s one thing that rises above all for a food truck it seems to be the quality of the food. Of course you want your truck to be appealing and approachable to the eye, but we’ve all gone to that hole-in-the-wall joint to eat because the food is scrumptious and totally worth it. You need a signature flavor, something that sets you apart, especially if you’re just another sandwich, bbq, dessert or hot dog truck. Don’t assume you’ll be profitable just because you’re running a good operation. Set the bar high, develop your recipes, consistently deliver the same flavor that will keep them coming back… it’s all about the food on a food truck, right?! If you can deliver great food then you have a better chance to succeed. Ten Best Food Trucks in Cincinnati – List of some of the best food trucks in the city according to Yelp.com. Cincinnati Food Truck Association – Great resource to discover upcoming food truck events in the area or learn more about starting your own mobile food empire. 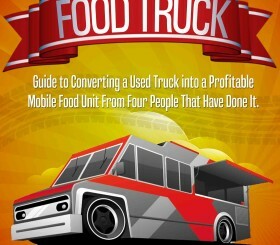 Case Study – Check out a full-blown case study about one entrepreneurs journey to start a food truck.